Looking at the future is like holding a mirror to the present: trends, risks, opportunities can be seen more clearly, which are otherwise submerged in the day-to-day. But there is never one version of the future – so we use alternative future scenarios, to explore the possibilities, stretch our assumptions, and test ‘what-if’ ideas. GM2040+ aims to build a ‘Success Scenario’, i.e. to explore how GM can ‘survive & prosper in a turbulent future’. To make sure this can withstand anything the future is likely to throw at it, we test this against a range of possibilities, in the shape of 4 ‘External Scenarios’. In order to move quickly, we are borrowing these External Scenarios from sources including the UK government and the Inter-governmental Panel on Climate Change. They were most recently used in GM for the Green Infrastructure Group, and the EU funded project PLUREL on www.plurel.net. 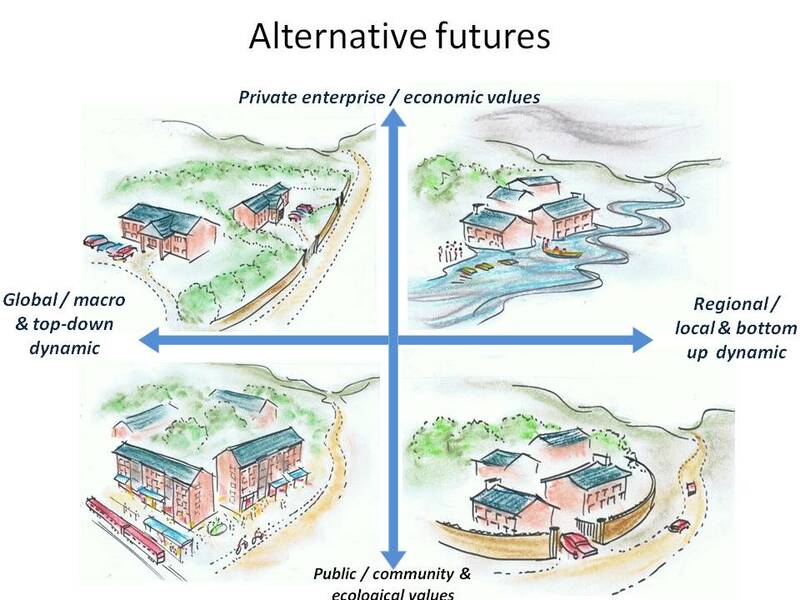 There are similar ones in some of the working papers on the UK Future of Cities program. The future could be more top-down, centralized and globalized: OR it could be more bottom-up, decentralized and localized. (This is very topical with the debate on devolution for GM). The future could be more private sector entrepreneur and market focused: OR it could be more public sector responsibility and community focused. With this 2×2 range of possibilities, there are 4 scenarios, one for each of the corners. We’ve given them basic names to say what they are (more creative names are also possible). Then we’ve explored some of the likely implications for Greater Manchester. rapid economic growth, medium population growth and migration, and the rapid spread of more efficient technologies. Information and communications technology (ICT), nano-technology and bio-technology, transform lifestyles and working patterns. Urban patterns see more small ‘polycentric’ towns and cities: ICT changes the whole pattern of work and leisure, with peri-urbanisation and ‘metropol-ization’ of rural areas on a massive scale. For GM: most of the city-region is run by multinational corporations: this includes a ‘franchised’ Mayor and local government, where decisions are made with ‘Big Brother’ style celebrity-crowd-sourcing. The Manchester Axis (Media City-Centre-Universities-Airport) grows rapidly, bringing huge wealth to its workers but sucking investment out of declining areas, which supply an army of low-cost labour. A world of self reliance and deregulation, local enterprise and local identities. While population growth and technology innovation are slower, the effects of climate change come rapidly, and there is major disruption to urban economies, services and infrastructure. Urban development is patchy, adhoc and deregulated, with the result of urban sprawl: building standards are lowered, and many eco-habitats are developed or degraded. For GM: most public services are privatized and run by local /regional firms. Local government is reduced to a ‘charity fundraising’ role, dependent on local philanthropists. Towns such as Bolton, Oldham etc, cut loose from Manchester, and try to re-invent local civic pride on a shoestring. This is driven by a global approach to sustainable development, led by governments, with just a few sacrifices on individual civil liberties and local enterprise. Energy and resource shortages begin to shape location choices and urban structures, together with climate change impacts. There is a return to larger cities and towns, while more remote rural areas decline. For GM: now the thriving centre of a ‘Northern Arc’ with a polycentric city-region from Liverpool to Newcastle, a global hub to rival London for finance, professions, education, culture etc. Development pressures on urban and rural areas are eased by a wide network of high speed rail / transit / driverless roadways etc, with large reinvestment in deprived & declining areas. Many social groups retreat into urban or peri-urban enclaves, amid the fragmentation of society by generations, genders, ethnicity and special interests. The ethnic division of cities is driven by the increased in-migration of the working-age population. Cities disperse as younger migrants dominate city centres, older natives move to gated enclaves, and peri-urban areas become ‘peri-society’. For GM: many people downshift and drift away from the city centres, in search of liveable neighbourhoods, ecological lifestyles, third age co-housing communities etc. Many new communities take root in the peri-urban and rural areas of Cheshire, Lancashire and the South Pennines. Economic growth is lower but ‘quality of life’ factors might be higher.